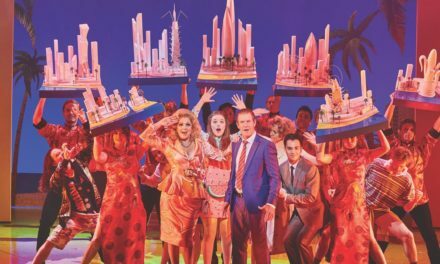 Come From Away, a relentlessly peppy new musical by the Canadian husband-wife team David Hein and Irene Sankoff, tells the story of how the remote town of Gander, Newfoundland (pop. 9000), welcomed more than 6000 stranded airline passengers from 38 grounded planes when the FAA closed American air space on 9/11. It is a worthy story on its face. The real Ganderites certainly behaved magnanimously. 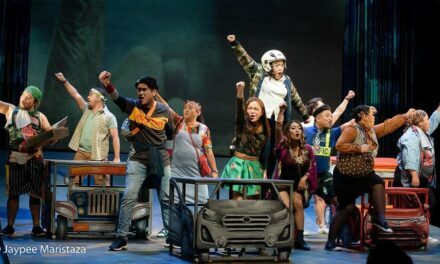 As we learn in the course of this show’s 100 hectic minutes of thumping group numbers, performed by a cast of 12 shifting among dozens of roles, the locals acted with extraordinary selflessness. They served food they cooked themselves, volunteered store-stocks, prepared public buildings, hotels, even their own homes for shelter: unflinching generosity and humble hospitality that deserves honor and praise. Why then does this show seem like an extravagant shadow-play produced by the Canadian Tourist Board for an audience of Plato’s cave-dwellers? 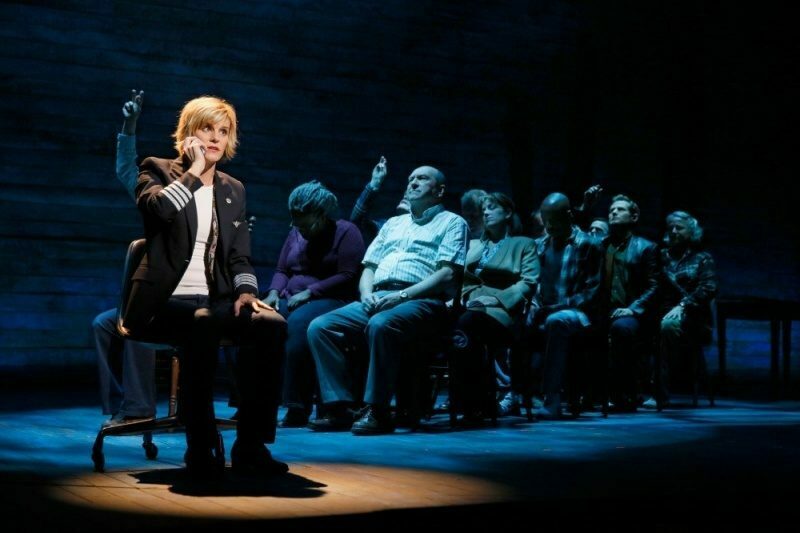 Come From Away’s producers say that it’s really “a 9/12 show,” not “a 9/11 show.” What they mean is that it’s not about terrorism per se, and therefore gloomy, but rather about the heartening spirit of unity and communion that arose in its wake. Those of us who were in NYC then (and lots of other places) certainly remember this feeling and rue its disappearance. Come From Away tries to recreate the sense of tolerance and fellowship the emergency generated, showing, for instance, an Egyptian passenger being segregated and avoided at first but then included and accommodated, and a gay couple nervous at first about being out in Gander but finding the locals unfazed by it. Four days of improbable brotherly love and multicultural harmony at the rocky edge of North America: it should warm your heart. Every tale of a utopian Land of Cockaigne is really the shell of a lie. For one thing, Come From Away offers an escapist spectacle of unacknowledged white privilege. 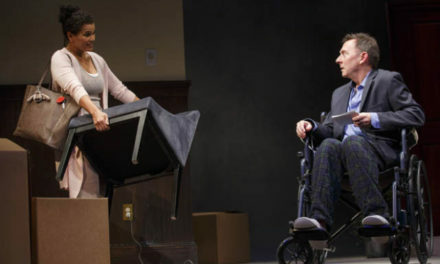 Because everyone in the play is either an airline employee, a passenger wealthy enough to buy an international airline ticket, or a middle-class Canadian, the people-mingling challenge the town faces seems far less vexing than it’s made out to be. Also, their genuine compassion aside, the main reason the Ganderites can afford to be so generous is that, like most first-worlders, they have oodles of surplus resources. Their model behavior is decidedly convenient—no crime, obviously, but not exactly a universal model either. Crowing about it for 100 minutes starts to seem self-congratulatory. And while asking New Yorkers to revel in such a fable might have been fine as lite entertainment had Hillary won the election, it feels a little tasteless now with the crypto-fascist currently occupying the White House inviting another 9/11 every day with his reckless belligerence toward all non-white Others. We remember too much about what happened in the wake of 9/11 (some of us, anyway) to feel the love adequately in anecdotes of stranger-bonding from back then. That era’s destructively ignorant President, W, whose hollow words of consolation and defiance are channeled by a Come From Away cast member, wrecked all hope of more Gander-like communion experiences for probably a century to come when he plunged the U.S. into two wholly unnecessary wars, which multiplied our enemies and compounded our dangers. That is the big, scary reality behind this innocuous little shadow of a show. Ignore what’s behind you if you want to, but don’t imagine you’ll learn anything meaningful about it unless you turn around. This article appeared in Capital Critics’ Circle on March 30, 2019, and has been reposted with permission.